Previously, we introduced PentaTM as a revolution for future technology that will completely replace PC and serve the business requirements in different aspects. The solution and product are now can truly be evolved along with the fast trend in the world of Cloud Computing. Let?s start getting into more detail about highlighted features of PentaTM for new solution development or even for enhancing or resolving issues for the existing solutions. The PentaTM Application Framework offers one of the powerful tools called ?Smart RemoteTM? that is used for communication between PentaTM and PC, Smart Phone, and Tablet. Such feature enables such devices to become an Adaptive Remote which can change its user interface to accommodate such application. A cool Card game is a perfect example of such feature. In this case, the screen connected to PentaTM shows the pot whereas the players? smart phones display players? hands. Not only does the feature allow multiple users to interact with the application at the same time, but also developer to design the application in the most efficient interactive way. Another interesting example is to use Smart RemoteTM for developing Interactive Quiz application that uses main screen to show the problem set and enables the students? smart phones to participate the quiz. Since the teacher has solely control the contents of each display, only the result of the quiz can be anonymously displayed on the main screen for more discussion. 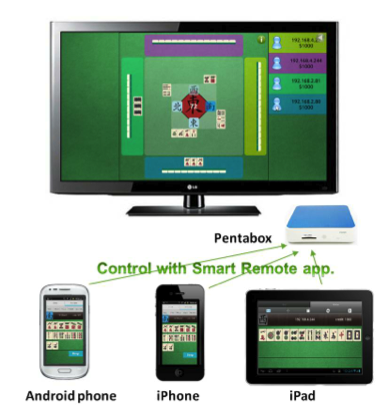 For device control purpose, PentaTM can manage appliances, such as lighting control devices, security camera, etc., over the Smart RemoteTM. 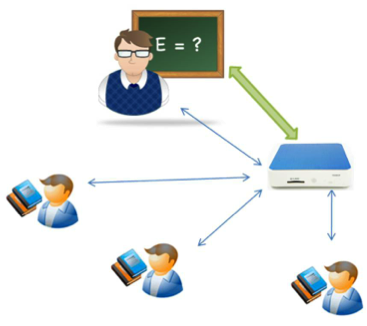 If user can access PentaTM from the Internet, all these devices are automatically upgraded to Cloud-capable devices without connecting to any extra device. In the same way, non-Wi-Fi-capable devices can be transformed to Wi-Fi-capable devices by connecting to PentaTM which has the access to Wi-Fi. 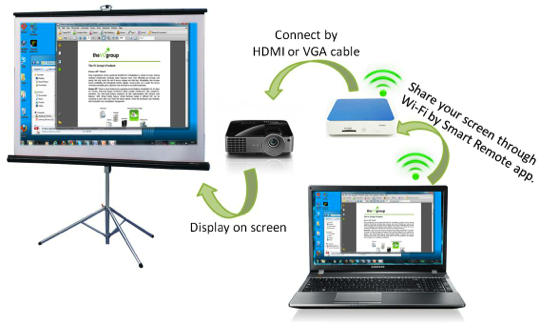 For example, a computer screen can be displayed on the projector connected with PentaTM over Smart RemoteTM.